Here are some companies, products, and other blogs that we highly recommend – so much so that we’re giving them free publicity! King Arthur Flour – Great quality flour that we use for all of our baking – breads, pies, cakes, brownies, pancakes, etc. They are also very involved in community and environmental outreach programs. Pick up a bag or two at your local supermarket or order online. 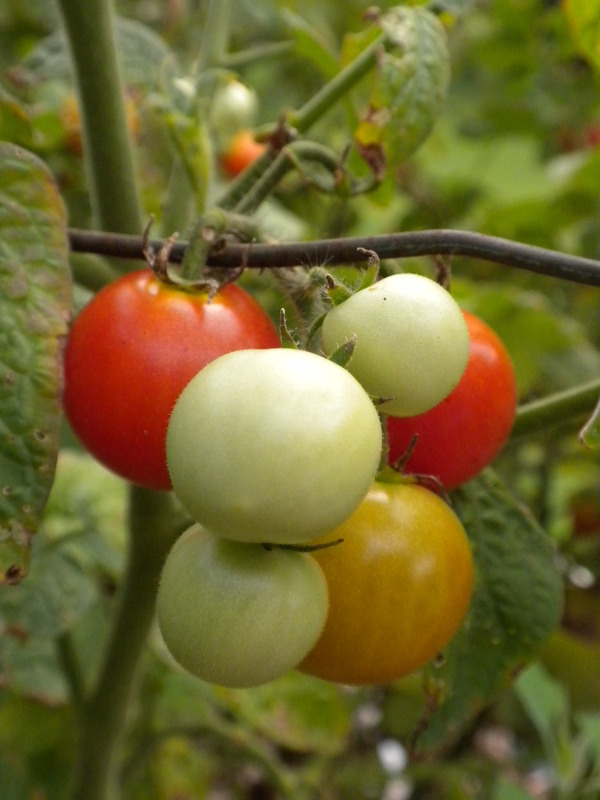 Baker Creek Heirloom Seeds – Non-GMO seeds. We’ve been ordering from this family company for years. If you want to grow it in your garden (and it’s legal to do so), you can find the seeds there. Fight the huge AgroBusinesses and the government agencies they are in bed with and feed your family real food. 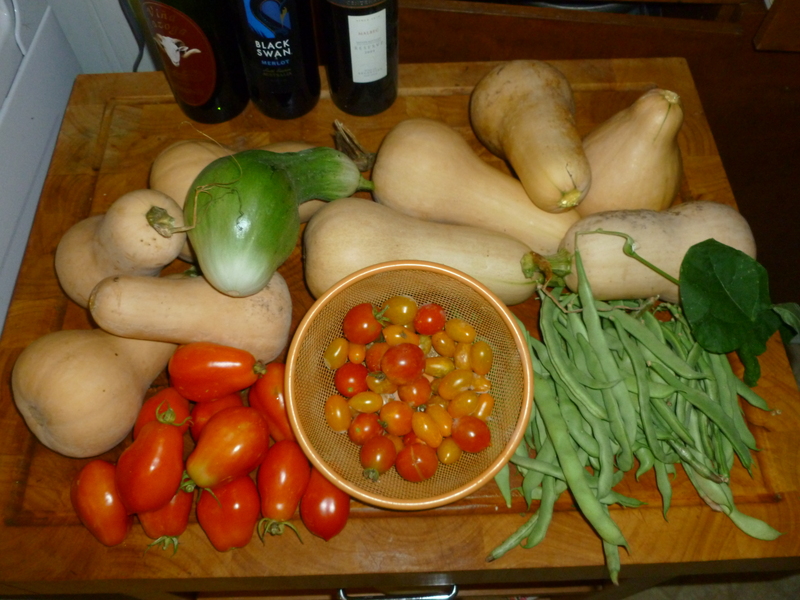 Here’s a sample of our harvest this summer (sadly, wine does not grow in our garden). Mobjack Bay Coffee – Delicious coffee roasted right here in Gloucester County, VA. All of the beans are certified organic, fair trade, or rainforest alliance, and a portion of the company’s profits go towards cleaning up the Chesapeake Bay. Add in the fact that the owners, Jo and Celeste, are pretty awesome people who always have smiles on their faces and you’ve got yourself one fine cup of coffee! Out of the Box Radio Show – The most unconventional radio show around. Locally grown, but streamed globally, Paul Shugrue mixes the latest and often least heard rock, Americana and blues. Concert Series – Sadly, the much beloved Bena Country Store was forced to close because the music wasn’t appreciated by their landlords. However, the lovely and down-to-earth John and Heidi Warren will use their keen skill at attracting awesome Appalachian artists to bring music to Bena (and surrounds), resurrecting the concert series soon. Blue Moon Wicked 10K – A fun Halloween-themed race in VA Beach that I’ve done a couple of times with my BF and running partner, Lynn! An out-and-back with awesome costumes and a boardwalk & beach finish! Seriously, it’s worth it to walk and see the costumes – some of them are extremely large and funny and require a slow pace. One year there was a dude wearing a gigantic squirrel costume with a bowling ball-sized acorn dangling by pvc-piping in front of him. Trust me, he walked. Virginia Is For Lovers 14K – Another VA Beach race. This is a cool love-themed race; it’s improved each year and people wear costumes, which is fun. You can enter as a couple team or as a single. Lynn and I ran this in the female-female category in 2010 and then W and I ran it in 2011 with friends. In 2012, W and a coworker finished it (I gave up my spot and spectated as I was preggo). This year, we’re probably not up to running the 14K yet, but plan on keeping this in our calendar in future years. There’s a flower at the finish for every lady and tasty burritos and beer afterwards. 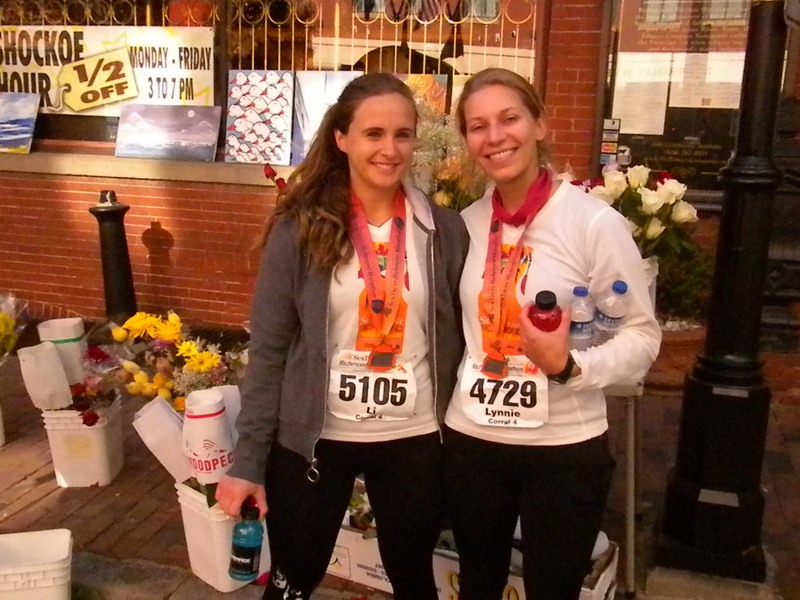 Richmond Marathon – The “Friendliest Marathon”! This was my second (L) marathon – ran it with Lynn in 2010. It winds through several cute neighborhoods, past a lovely lake and over the James River, with a crazy downhill finish. I highly recommend it for it’s varied terrain and fun atmosphere! Here we are after the finish…only slightly dewy! The Noland Trail – An excellent place to trail run on your own in Newport News – It’s a 5-mile loop, well-maintained, mostly in the woods but with glimpses of the James River. We’ve participated in the 5K (and there’s a companion 10k) for several years. Zenya Yoga – Great instructors and atmosphere, and classes for all levels including yoga during pregnancy. I got a groupon for this studio with Lynn and then she ended up getting her yoga teacher training certification here – a testament to their quality classes and staff! Bead Retreat Boutique – An awesome local bead store, the proprietor, Cindy, is super sweet. The store is very aesthetically pleasing and lends itself to helping you envision super crafty afternoons, and who doesn’t love to buy things for 4 cents…they do add up! Posie Gets Cozy – My favorite blog, hand’s down. Alicia Paulson exudes crafty, comfy and creative while pretty much being the sweetest person on the planet. She can cook, she can crochet and she puts it all down in a simple, stylish and straighforward manner that is a pleasure to read. I’m a little jealous. MODG – You say it like “Modg, a grandma name.” But it also stands for Martinis Or Diaper-Genies. My fav potty-mouth, dramatic mom blogger. She suggests super splurge products and dispenses sass like a pro. Def not “G-rated,” fyi. Bowman’s Blog – The official MLBlog for the Atlanta Braves, Walter’s all time favorite baseball team. Deals, rumors, and general happenings of the organization coming from a trusted source. Will Travel For Vegan Food – Kristen shines light on vegan gems in cities throughout the country…and world! Big Flavors from a Tiny Kitchen – Ashley is a friend of L’s dad and dishes up some tasty recipes! MuseSweetMusings – A friend’s baking journal. Double-yum!